Federal Polytechnic Nekede (NEKEDEPOLY) National Diploma (ND) Evening/Weekend Part-Time Programmes Admission List of Successful Candidates for 2018/2019 Academic Session. Check FPNO ND Part-Time Admission List Online. This is to inform all the candidates that applied for the Federal Polytechnic Nekede (NEKEDEPOLY) National Diploma (ND) Evening/Weekend programmes admission that the admission list of candidates offered provisional admission has been released for 2018/2019 academic session. NEKEDEPOLY ND Evening/Weekend admission List for the 2018/2019 academic session has been successfully uploaded on the polytechnic portal . 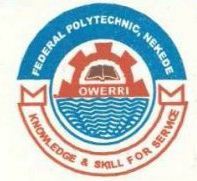 Kindly log on to Federal Poly Nekede admission status checker portal via http://ndapplication.fpno.edu.ng/Applicant/Admission/CheckStatus.